In the month of August I've been able to enjoy eating romano beans, cucumbers, zucchini and eggplants, all from my own garden. Even my apple trees and my two grapevines are loaded with fruit. 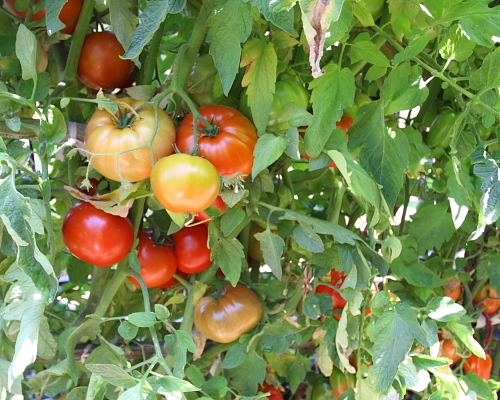 But because August was unusually cool here in the Bay area, some of the vegetables, like the tomatoes, didn't start ripening until the end of the month, which you can see in the photo below. They're growing on two trellis rows, and are so high that we can no longer tie them down--they are now taller than we are. 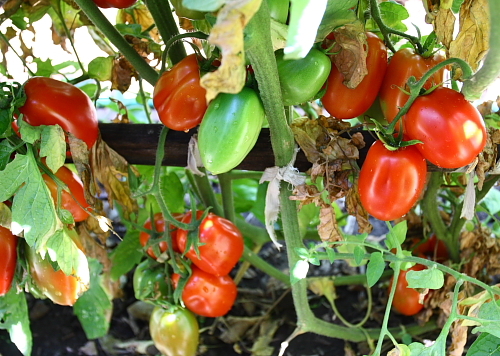 The majority of the tomatoes are the San Marzano variety. We brought the seeds from Calabria with us in the 70s when we moved to the Bay Area and my parents have always kept the seeds from year to year, so you are looking at real heirloom tomatoes! I will write a post soon on how to harvest the seeds so that you don't need to buy them every year. There are three other tomato varieties I planted along with the San Marzano: an early girl variety, a cuore di bue, or "ox heart", and sweet 100s, which are cherry tomatoes. My pepper plants are also abundant. 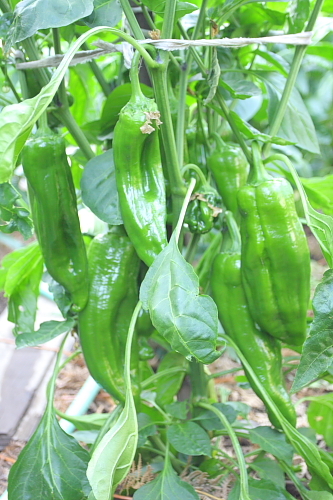 We have two varieties: sweet Italian peppers that we eat fresh as they mature in the next few months, and the peppers of Senise that we dry and make into peperoni cruschi, or grind intosweet pepper powder. When I tell my students that I buy no vegetables during the summer, I can about 80 quarts of tomatoes, and I still have enough produce to use in the cooking classes they attend, they think that I have acres of land. 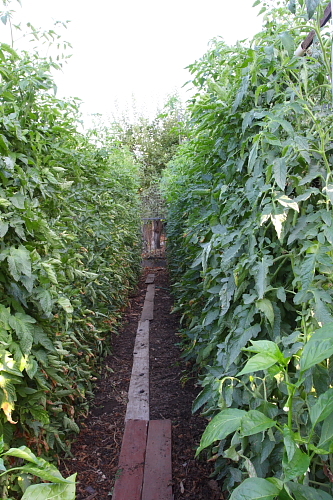 But the length of my back yard is only 50 feet, and the garden is six feet wide. There are also three other sections 20 feet long and three feet wide. We extend the garden a bit by using large pots on the patio, which hold basil, hot peppers, strawberries and even an extra cherry tomato plant that I had no other place to put. So how does it produce so much? It's the care and work that my dad puts into it that makes it so abundant. Here are two pictures that give you a view of my garden, the left side and right side where you can see the pots on the patio. We have another section on the side of the house with a lettuce bed, my zucchini plants, my citrus trees, and a nespolo (loquat) tree. Not bad for an urban metropolis like Oakland!